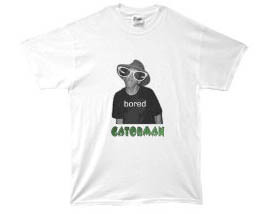 You want Driven By Boredom merchandise? I can help you out. Want funny Internet related crap? I can help you with that too. I found this page "Cafe Press" who makes Shirts, mouse pads and fun stuff like that with whatever you want put on them. They charge obscene amounts for this, so I only upped the price a dollar just to help pay for this friggin site (notice the lack of ads? I do). Now, if you sign up for Cafe Press put "DBB" in as your referer... I'd appreciate it. Keep my site ad free. Anyway, I may start making more and funnier designs, so keep a look out for more goodness. Click the shirt to shop!! Want more stuff to waste your money on? You could try one of my ebay auctions or buy some of the punk rock records I put out a few years ago.